In our study we reported synthesis, and experimental and theoretical characterization of new one-dimensional coordination polymers. Research article “Multiply Bonded Metal(II) Acetate (Rhodium, Ruthenium, and Molybdenum) Complexes with the trans-1,2-Bis(N-methylimidazol-2-yl)ethylene Ligand” (DOI: 10.1021/ic501435a) was published on November 13th in the Inorganic Chemistry. The experimental work was done in the group of Prof. Dr. Nicolai Burzlaff and theoretical part in the group of Prof. Dr. Timothy Clark. Approach used to prepare coordination polymers is a fascinating example of constructing predictable networks. In this work, two metal centres were μ-bridged by four acetate ligands. Resulting structures have a form of a paddle wheel. Individual paddle wheels are then bridged by N,N-donor ligand trans-bie to form a virtually infinitely long chain. Although metal centres are forced to be quite close to each other, bonding between them does not necessarily arise and depends strongly on the metal nature. 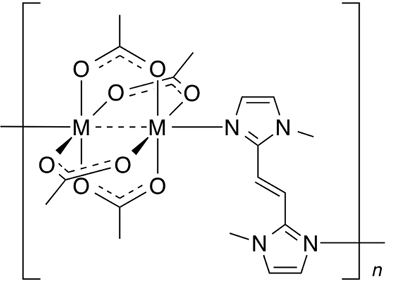 Mo–Mo in the paddle wheel with two trans-bie ligands has the formal bond order of four, while Cu–Cu in the same unit of a polymer synthesized earlier has no significant bonding at all. Rh–Rh and Ru–Ru formal bond orders correspond to single and double bonds, respectively. Note that not every metal lead to the same kind of structures. For instance, on attempt to prepare respective Zn polymer, it formed polymer of a different stoichiometry and structure. When Cr polymer was prepared, it was obtained in powder form, but no single crystal of this polymer could be obtained. Nico Fritsch, Christian R. Wick, Thomas Waidmann, Pavlo O. Dral, Johannes Tucher, Frank W. Heinemann, Tatyana E. Shubina, Timothy Clark, Nicolai Burzlaff, Multiply Bonded Metal(II) Acetate (Rhodium, Ruthenium, and Molybdenum) Complexes with the trans-1,2-Bis(N-methylimidazol-2-yl)ethylene Ligand. Inorg. Chem., ASAP. DOI: 10.1021/ic501435a.